Courthouse Step Foreclosures. Deal Or No Deal? Today I continued my research on the hunt for details on a possible upcoming influx of bank properties (due to a lift of the bank foreclosure moratorium) and to see if consumers are buying properties directly from the banks at the courthouse. So, I went to the courthouse steps in Arlington Virginia to see today’s scheduled auctions. First of all, all 3 homes set to be auctioned off were canceled. This happens frequently. The notice makes it to the newspaper, but the owner figures out a workout or a way to delay the process (sometimes multiple times). I then asked the auctioneer whether consumers are buying them directly from the courthouse. While he said “they can,” he also said they don’t because the banks are buying them back at their loan amount, which is usually OVER the market price. He estimated that 95-99% of the homes sold are being sold back to the lender. My theory is the banks don’t have the resources to fully figure out what a property is worth. So they just buy it back from themselves at full price, and then they try and figure out later what it is worth. They do this by hiring a BPO (Broker Price Opinion, a non-official, cheap appraisal). (Sidenote: Lawyer question how this will effect the Deficiency Judgments, see the comments in the older post). But this might change, so I will go back every year or so to make sure (I went there 2 years ago, and it was the same thing). If you are reading this from your email subscription, make sure you watch the video on VA Courthouse Steps Foreclosures. – Is it typically possible to view the property before the auction? – What are the risks of buying from an auction (other than potentially wasting your time)? – Once the price is determined, is there a difference between an auction purchase and a normal purchase? Frank, what I love is that you get SO into the mechanics and behind the scenes reporting. I had a condo listing and we did everything to get it sold before the hammer fell, including the owner trying to work out with the bank. But bank was determined to foreclose. And bank bought it. And now it’s five weeks past the ‘sale’ and tenant is still in the property, no sign of anyone knocking on the door. We could have sold it, just needed a little more time (my client came to me a little too late…). Bank owned the 1st and the 2nd, and foreclosed on the 2nd. Frank ~ they also buy back to wipe the title clean, don’t they? Brilliant questions Anonymous, I should have put them in my main post. Q. Is it typically possible to view the property before the auction? A. Nope. They usually have a very disgruntled owner or renter living there. Maybe if you bribe them with $50, but for the most part, you have to assume the worst. Watch out for trespassing. Q What are the risks of buying from an auction (other than potentially wasting your time)? A. You could write a book on the risks. Let me hit some. 1) See above, you can’t see inside the property. 2) You can’t inspect it. 3) Watch out for other Liens. You might pay $300k, but then there might be another $50,000 lien on it that you might be responsible for. You can pay a closing company a few hundred to do a title search or go to the courthouse and try to do your own search. Honestly, I looked into this 2 years ago, and I never really understood why the 2nd lien wouldn’t necessarily be wiped out. SO all I can say is don’t mess with it, unless you understand that the price you are paying is the full amount, and no other responsibilities. 4) You have to bring a cashier’s check for about 10% cash. 5) 99% of homes sell back to the bank, so you would have to check out 100 homes to get 1, and that 1 won’t necessarily be some bargain basement price. Basically until I go back again in a year or hear about people buying it from the courthouse steps, it just isn’t an option. Q Once the price is determined, is there a difference between an auction purchase and a normal purchase? Yes. All of the above. A normal purchase has more inspections, and you are buying it with a clean title. Hope that answers your questions, to the best of my knowledge. I can’t speak for Arlington, but I’ve attended several auctions on the courthouse steps in Montgomery County. Your description of Arlington’s auctions is similar to what I’ve seen in Mo.Co. Many of the properties are taken off the block at the last second (I’ve seen the auctioneer receive the call minutes before a scheduled auction). The trustee’s opening bid is often high enough so that no one bids on it. However, in Montgomery County, I would say that about one in 12 properties that actually makes it to be auctioned is bought. If the price does end up being low enough to entice bidders, you will likely be bidding against very experienced investors. You would have to be very patient, and invest a lot of time to both examine the properties, and attend the auctions. The guys that are buying attend just about every auction. Having been following this for a little while, it seems that with the DC area real estate market improving some, there have been less auction deals in the last month, then there were early in the year. You have the most useful and most informative site for real estate in Northern Virginia! What is the deal with realtytrak.com — they show a ton of foreclosed homes in the area — what gives? I don’t see them listed on mls websites. Are they real? Are the banks holding these houses for some reason? There are a ton of them?????? I think that site is a bogus bait and switch. Every single agent that I have spoken to about that site says the same thing. I don’t know one person that has found a home through it. They bring you in with over a year old data and then try and sell you a realtor to help you with a regular resale home on the MLS. Save your money. 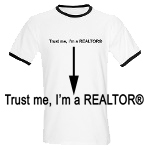 Much better is foreclosure.com or ask your Realtor to look at our new back end foreclosure data that we have access to. How long does it typically take once the bank buys back the home before they list it for sale as a foreclosed home? I’m guessing this varies by each bank? I’ve been watching a house with a mortgage that’s almost twice what it’s worth today so I’m guessing that the bank will just buy it back (whenever it can get to the courthouse since the sale has been postponed before). The house is pretty trashed, so I’m very interested in following the house to see how low the bank will go to unload it once they put it on the market. Thanks! Who knows, maybe an investor will get it on the courthouse steps. But it can take at least 2 months to get back on the market. But some banks are just sitting on them vacant for several months. Yes, the word is definitely that the deals are back to the Courthouse. That usually means cash, no inspection and close in 15 to 30 days. There are Lenders, but you need 30% down and can only get a 5 yr note (my experience anyway). I don’t think Frankly shows non-mls transactions, but I could be wrong. These transaction can be found on county web sites. by searching various neighborhoods. If an investor outbids the bank at the courthouse steps and investor put on the market to sell, Is the property considered a foreclosure? Than why do the banks call it a foreclosure? Each party acquires it the same way. Sorry, it is just industry slang. If a property has already been foreclosed on and taken over by a bank, it is a REO or Real Estate Owned. Why isnt it called BO? I dunno. I guess Foreclosure sounds sexier. I had the same experience at the courthouse steps. The homes, soon to be bank owned property, went to the bank at what seemed like the loan ammount of the first trust. Does anyone know how the price is determined when selling your house on the courthouse steps?Can I set the start out bid? In the state of KY does anyone know if I can set the amount for the starting bid since I am the owner?